I really hope he can pick up where he is left off from last season. He was scoring in almost every game towards the end and just settling in. Hopefully a full pre-season with the team will work wonders for him. He is our best #10. And a brilliant take from him for his goal against AS Roma today. Positive for me is he looks like our first choice no.10 don't want him shoehorned out wide. Like I said in the Rooney thread, I think both him and Rooney playing in their best positions will both have brilliant seasons. Hopefully Van Persie can stay fit as well because fit and on form there aren't many better world wide. That attacking trio, if they stay fit, can potentially be up there with the best attacks in the world. On paper it already is, but they just have to show it on the pitch. He's going to exceed the heights of 2012/13 when at Chelsea. Goals from midfield is something we have lacked for a while and he gives it. I am not sure that the 3 are the ideal combo in this formation as in player types. But we'll see..immense quality there. I don't know, people on here are a little too concerned about pace sometimes I think. While it is a huge advantage to be really fast, it's not the be all and end all. There's pace elsewhere and Rooney is no slouch, just not lighting quick. Quick play and quick and intelligent thinking has a much bigger impact for the speed the play, rather then a players actual pace. The 3 of them have brilliant movement and are such smart players, that even though there isn't somebody there who has blistering pace, I think they could still tear teams apart through their movement, skill, and just generally being so clinical. You always want the threat of pace behind the defence or they'll push up and squeeze. Don't doubt that they'd be able to carve teams open, but it would be a lot easier with a bit of real pace to keep the defence honest. If we could get a holding midfielder to sit deeper so that Herrera can go forward and help attacks, then Mata will have a brilliant year. Can't believe the crap written by Ian Ladyman in the daily mail today about Juan Mata. 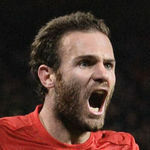 According to ladyman, Mata didn't play well, described his impact as negligible. Said he failed so much that Giggs played him off the bench in his fist game in temporary charge. I must admit I thought he was one of the plus points of the second half of the season. I thought he played well given the disjointed first half of the season he had. The 'Mata was poor' narrative is one of those baffling situations whereby journalists openly pursue agendas even though the evidence all points to the contrary. Mata was probably our best player from February onwards. It's not saying much, I know, but he demonstrated a lot of quality come the end. Best player at the club for my money. Mata need's to have bodies around him to play properly, he isn't an athetic player who is going to dribble passed 2 players, but give him a player to bounce the ball off or play a neat pass into and he will excel. As LVG stated he plays with his brain and not his legs, that run for the Roma goal was perfect with a great finish. Such a loveable bloke that Juan Mata. If we continue to play him in the No10 role with Two strikers ahead of him, especially Rooney and RVP. The football at times is going to be breathtaking. Beard or no beard, he is one handsome fecker. I know he's new, but damn it, give him the fecking armband! I can feel it he'll be our modern Le King. I am expecting a real big season from him. People forgetting how good he was for Chelsea under Benitez the season before last. Carried them at times into 4th. As the days go by, he looks more and more like the Rumpelstilskin from Shrek. Edit: Sorry for the big image. He still looks a yard off the pace at the moment, but is still producing some quality moments. Vital we surround him with pace, so he doesn't have to be relied upon to beat players. Good game from Mata mind. Just from the clubs site. Looking forward to a full season of blogs and hugs. Some people say it takes time to truly settle at a new club; do you feel that you are a Manchester United player now? Yes I do, and this is down to the players in the dressing room who have helped me a lot. They are a great bunch of lads who made it really easy for me in my first six months. That's true, in fact it'll probably be the only full pre-season I get because I'm always playing tournaments in the summer. It's nice to be with the lads and the new manager and it was great being on tour, appreciating what it's like to be in the States with United. Are you happy with your own form on the pitch? I am. At times during last season there were hard moments for everyone but I always tried to do what I do which is to score goals and set my team-mates up. I scored six goals last year and I am looking forward to hopefully do it again and again this season. Why do you feel that the United fans took to you so easily? It often takes time for the fans to accept a player, but with you it happened so quickly...I noticed that straight away, right from my debut. My first goal, at Old Trafford, was really emotional for me too. I am extremely grateful to them for their support, always in the stadium, the training ground and even in the street, they always show me their support – that's really important for me. Social Media seems very important to you as well, why is that? I find that it's really good for connecting with your fans to show what you're really like and give back some of the love they give to you. I get a lot of messages and a lot of mentions, so it's nice. I like to be in touch with the supporters so I know what they are thinking. Obviously you need to be focused on playing first and foremost, but it's fun. I enjoy that. I have been doing it for around two seasons now and it's nice. It takes me around 30 minutes after a game. Sometimes it's hard when you've lost a game and you're very tired and all you can think of is the next game but the fans seem to enjoy it and I think it's nice for me to let them know what I'm up to, whether it be about feelings of winning and losing or about something I've been doing in the city. The good thing about it is you can use it to show everybody exactly who you are and exactly what you want to say. Sometimes things are said in the press that you don't say so you can show your true feelings via your own channels. Finally enough for an all Spanish speaking 4 square game. You skank, you want to be spit roasted by the 4, don't you? Mata is way too classy for Chelsea. Mata, De Gea and Herrera have their United jackets on, Chicha doesn't. He is probably the most likeable player in the Premier League. Even at Chelsea when he routinely destroyed us I couldn't hate him.